4Easysoft MOV to AMV Converter is the best and most professional MOV to AMV conversion tool for you to convert MOV to AMV. With a few mouse clicks, you can easily convert video and audio formats, including QuickTime files, QuickTime HD files, AAC, M4A, AIFF, MP3, MP2 etc. This video to AMV converter can also help you get MP3 and other audio formats. During the conversion process, 4Easysoft MOV to AMV Converter assists you to choose some detailed control, such as merging several files to one, adjusting effect and selecting the length of the video by applying crop and trim. In a word, it is the best software to convert MOV to AMV for you. Video Brightness, contrast, saturation are adjustable to customize original videos. What’s more, you can add watermark as you like, in text or image form. Set videos Encoder, Resolution, Frame Rate, Bit rate and audio Encoder, Sample Rate, Channels, Bit rate to get best quality. What’s more, you can input your own resolution parameters. It supports to deal with multiple output formats at one time conversion. Take snapshot when preview original and edited videos and save them into default folder. The "Merge into one file" feature helps you to join several separated files into a single one. It is possible for you to choose audio track and subtitle you like. 4Easysoft MOV to AMV Converter is absolutely easy to use. 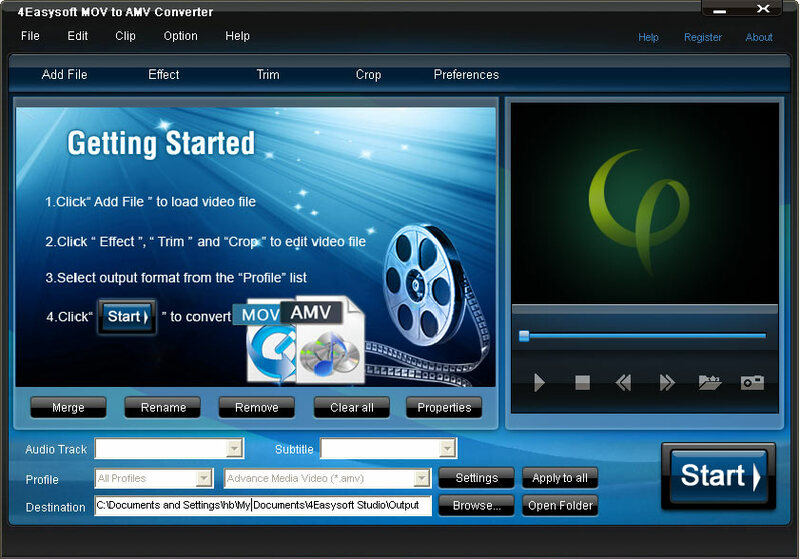 The whole process of converting MOV to AMV can be finished in few intuitive clicks.